A few weeks ago I was faced with the possibility of a really challenging health issue. Praise be to God, most of my fears of what it could be have since vanished. But in those days of trips to urgent care and extensive testing, I would be lying if I said I wasn’t terrified. As I was pushed into the MRI machine one sunny late summer morning I took some slow, deep breaths as I forced my logical, Type-A self to think about how I could get through the next hour. I remember thinking about all of the people in the world who don’t even have access to the medical advancements that my doctors could readily employ, and I said a prayer of gratitude. I prayed for my deceased dad’s intercession and for the Saints’ intercession, especially those who are patrons or patronesses of neurological disorders. Then I thought of my nieces and nephew and God-babies and felt this immense sadness as I pondered what their reality would be if I simply ceased to be in their lives. That’s when the tears came—slowly, silently, trickling down my temples. It’s the only kind of crying allowed in an MRI because you have to hold very, very still! Even now as I write this, the tears come, as I re-live the myriad of emotions from that day. There are those who have gone before us, through the times of great distress, and have come out on the other side at the foot of the throne of grace and peace and mercy and Divine Love. Similarly, our Lord’s words in Matthew 5 remind us that when we are persecuted, when we mourn, when we hunger and thirst for righteousness with seemingly no avail, we are actually at the gates of the Kingdom of Heaven. 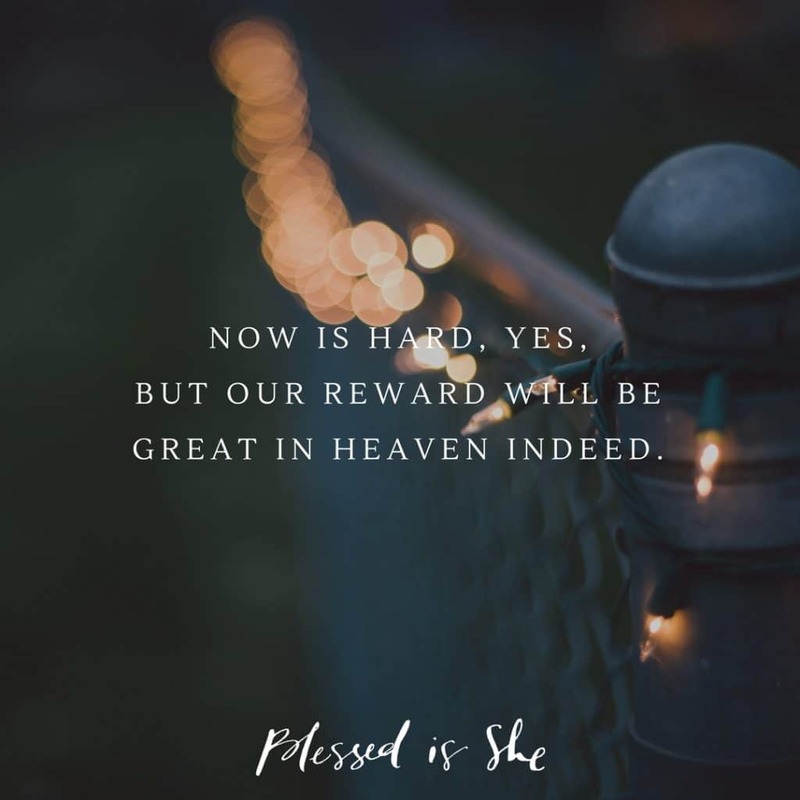 Now is hard, yes, but our reward will be great in Heaven indeed. Now is hard, yes, but our reward will be great in Heaven indeed. Today is the Solemnity of All Saints, a Holy Day of Obligation, which a priest friend once told me should really be called a “Holy Day of Opportunity.” If you don’t know where you can find a local Mass, check out this site. Come to Mass today and think of the burdens you carry, large and small. Take the opportunity to cast them into the arms of those Saints in Heaven who pray for you and with you to Jesus with great earnestness, love, and devotion.